Traditional and modern western square dancing have a universal appeal which encompasses all ages and levels of ability and social commitment. Teaching square dance to young children, teenagers, adults, senior citizens, and even some handicapped groups continually draws unique interest and social interplay to this great activity. One thing that is attractive about all dancing is it gives insecure persons an opportunity to shed their inhibitions and the opportunity to derive enormous satisfaction from interacting with others in a friendly setting. Every local square dance caller has their own way of calling a dance and just about every caller will add short rhythmic lines to add excitement to a square dance. The dancers’ challenge is to listen for the dancing directions within the patter and then the entire square will act as a team and execute the square dance calls. Following is a short outline for teaching the most basic set-up of the “squared set.” This is taught the first few minutes of any square dance party or any beginner class. It is imperative that all directions be simple in description and extremely clear so as not to confuse anyone learning for the first time. The basic setup for square dance is the “squared set” which is comprised of four couples, making a total of eight dancers, who stand within the formation of a ten foot by ten foot square, each couple taking a side, or position facing inward, toward the center, to create a square shaped figure on the floor. Each couple has their backs parallel to one of the four walls in the room. Within the “Set” each Lady stands on her dancing partner’s right side. The First Couple is facing toward the back of the hall and have their backs to the caller platform. The Second Couple is on their right, the Third position is opposite to the couple in the first position, and the Fourth on the First Couple’s left hand side. First and Third Couples are identified as the “Head Couples” (1 and 3) and the Second and Fourth are “Side Couples” (2 and 4). For every man’s position the Man’s “Corner” or “Corner Lady” is the woman on his left. The Lady’s “Corner” or “Corner Man” is the man on her right. The “Home” position is the traditionally established location on the squared set of eight persons that everyone ideally returns to at the end of any directed sequence that the dancers move through. Tell the dancers they are standing at the “Home” position, which is the starting and finishing position of all square dance figures at all levels of dance. Set – Four couples comprise a set. Each couple stands on the side of an imaginary square. Couple – Two dancers side by side, each comprising half of a traditional pairing that historically has matched a man standing on the left side with a woman directly to the right. There are four couples in a Set. Corner – The Gentlemen’s Left- hand Lady is the lady standing on his left, or his Corner Lady. The Corner Man is the Gentleman standing directly to the right of the lady. Both terms Corner and Left Hand Lady mean the same thing and these two gender based position identities are directed in the perspective of the Gentlemen in the square. Opposite Lady (or Gent) – The lady or man standing directly opposite a dancer’s position, as in the case of Gentleman number one and Lady number three. Home – The station at which all couples occupy at the beginning of a square dance set of calls. Left Hand Couple – The couple in a set standing one station to the left of a designated couple in a squared set. For example, Couple 4 is the Left Hand couple in relation to Couple 1. Right Hand Couple – This is a couple standing one position to the right of a designated couple in a set. For instance, Couple 2 is the Right Hand Couple to Couple 1. Right Hand Lady (or Gent) – The lady or man that is occupying the position to the right in a squared set. For example, Lady 2 is the Right Hand Lady of Gentleman 1 in a Set. 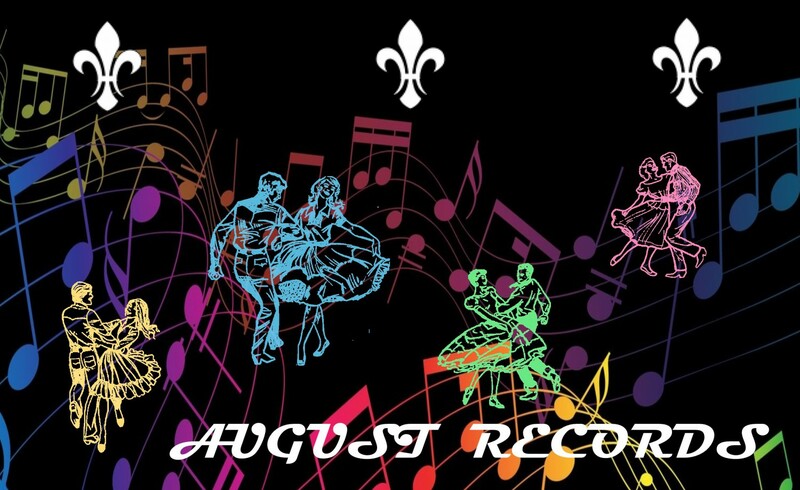 Worldwide, throughout the years of this activity’s progress, all modern western square dance callers have developed their own method of calling a complete dance. At the heart of this approach is the selection of choreographic ideas for both hoedown patter calls and singing call figures. When teaching, all of the focus should be on the featured call that is being taught at that particular moment in the session, and not just repetition of the call should be instilled, but also the new dancers need exposure and clear explanations and familiarization of different basic dancing positions and variations of that call along with formation awareness. The primary mindset as a square dance caller is to direct every student dancer through various positions and combinations of choreographic calls smoothly, rhythmically, and in an energetic and entertaining manner. To accomplish this all callers, whether they call modern square dance or traditional square dance, need to provide to the dance floor succinct and concise explanations of how the mechanics of a new call should be delivered without complicated and confusing words. The ultimate goal for the caller to convey to the learning dancers is that they understand the basic movement of the call and to know that there are other choreographic possibilities for almost every call ever written. By learning the rule, rather than the most common traffic patterns that are called, all dancers will be much stronger and confident in their dancing and they will be able to apply this to many different positions. At the end of the teaching session for the new call, announce that if dancers have questions regarding the call to come seek you, their teacher, for more help. This allows any new and/or confused and struggling dancers another opportunity to get questions answered and for you to teach a different and more “hands-on” direct approach for the new dance move and how to dance it successfully. The most basic square dance calling approach is to use the “command call.” This is when the caller simply gives the call, then waits for the proper number of beats of music until the next command is given to the dance floor. It is calling at it’s very simplest, stripped down and lacking any extra wording whatsoever. Command calls can accompany either hoedown music or the singing call portion of a square dance tip. Tracking the number of beats is absolutely essential to the timing of this style of square dance calling where the rhythm is so prominent and drives the dancing. Command calling is most prevalent in the Advanced and Challenge levels of modern western square dancing where it is used to keep the calls simple and direct. The best way to teach new dancers how to get through a combination of calls when they are confused as to where to move to on the dance floor is to advise them to watch other dancers within the square. Advise them to combine this approach by staying in place, not panicking, and then wait for the next call. By teaching dancers this method of recovery, they will better be able to dance in harmony together and they will succeed in completing more involved square dance choreography. Of course, directing the dancers with well timed patter that works in rhythm with the music is a cornerstone of great square dance calling, and to not provide musical phrasing that is in synchronization with the beats (working in 4/4 time or 2-beat) will only alienate the dancers and you will not be guiding the dancers by the musical beat of the song. Work on using rhythmic and effective patter words in your practice sessions and everyone at all classes and regular dances will benefit from you doing so. Have a great teaching session! If you need a square dance caller to teach for your gathering, please keep me in mind. If you need help in improvement in your square dance calling, please contact me. I will make your group’s event plans fun with an entertaining square dance party! 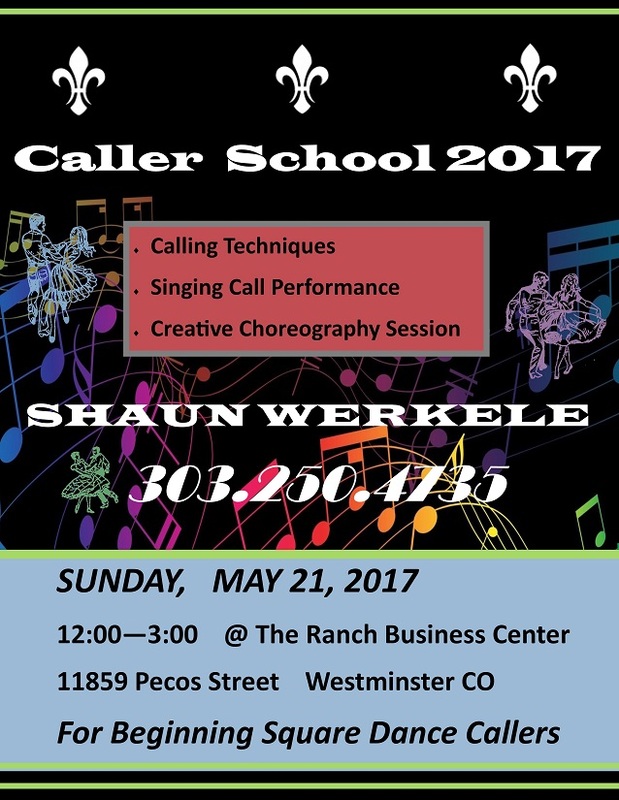 I will be offering a short and condensed beginning caller class on May 21, 2017 for a special three hour session focusing on customizing your calling style, singing call performance tips, and a one hour choreography session. See the ad flyer below. Please call for more details. Mission Statement: The purpose of this post is to create a greater visibility of the square dance activity for future dance population growth on a national and local level. The coaching information provided here serves as a source for square dance caller education training and perspectives on dance. Future articles will be developed to improve the programs of square dancing and how those learning to square dance call can help contribute to the preservation of both modern western square dancing and traditional square dancing and to aid in the growth of the square dance activity. There really is no better way to find out how fun and enjoyable Advanced level square dancing is until you give it a try and see for yourself! As a group, everyone will become stronger dancers, new dance moves are learned, you will have lots of laughs, and there are SO many different square dance choreography ideas that you will learn. On day one, so much is taught that opens new doors in challenging and highly technical dance moves that will make for lots of fun. If you dance already, check into a class for Advanced level, you will enjoy it immensely! CALLING TIP! Once you change your overall choreographic approach and use many good choreographic figures, the dancer’s abilities will increase dramatically! Anything and Cross comes in handy for singing call figures, so add this simple foursome to your calling arsenal of choreography. Educate yourself as a caller first, then apply that learning to teaching the dancers to expand their abilities! Advanced level is for the dancer that has been dancing Mainstream level and PLUS level square dancing for at least 2 years and they want to advance in difficulty. As a prerequisite, they need to be participating in regular weekly dance with a local group. You must have and be able to execute all choreographic moves already learned proficiently and be able to commit to weekly classes to learn the A-1 and A-2 basics and work well in a team environment. Call for more information! As a modern western square dance caller, there are many elements that have to be considered in terms of performance. One highly effective practice technique that I recommend is putting some time in front of a mirror while you are practicing. Working on standing in front of the mirror and practicing your calling routine is an entertaining technique as old as reflection itself. This kind of self study has existed since man has been able to speak, since you can see yourself reflected and this allows you to view clearly what you say, how you move. It is a tried and true practice approach that goes back a long, long time. The practice approach is incredibly simple, yet the real hang-up is actually putting in the effort every day. Nevertheless, there are many things that you can improve upon by doing this consistently. You will want to focus on your standing posture, your tone of voice, accent, pauses between sentences when you are speaking and your facial expressions. Above everything else, always talk clearly and slowly and loudly enough to be understood clearly. This is something that must be practiced to show any significant improvement. The actual calling part is similar to the above. You need to know what movements to make with your hands and when to use hand gestures while you are practicing your delivery of choreography and dance figures. First, watch yourself moving your hands before you make any changes. Then see where you move in a jittery and erratic way. Are you moving too fast or standing in place without moving your feet at all? Standing still is not good. You will not be very dynamic in your presence. Do you have a tendency to get a little nervous and then shuffle your feet back and forth and sway? Knowing what to do with your stance and how to stand and move with confidence is a great start to improving your stage presence. Related: For The Square Dance Caller: Sparkle Your Entertainment! Not knowing what to do with your hands can lead to you making fast gestural movements. This is not a desirable approach. Slow down your movements until they are relaxed and calm in projection. Conversely, you do not want to be afraid to use your arms and hands when calling. Good strong gestures will only make you appear confident and strong. Study the hand movements of performers singing on television and take notes. Move your hands in similar ways as the big stars do. They have spent many hours practicing their presence in terms of gestures, moving on stage, and even their facial expressions and smile. Try to take a slower and elegant stance with calculated and deliberate slow walking steps. Moving around is OK and taking up some space with confidence is the end goal. You want your movements to seem powerful, yet effortless as you square dance call. Eye contact with dancers is a must. With the advent of laptops to provide music for callers, this has led to many callers constantly staring at their laptop screens to read choreography. This is an absolutely horrible way to entertain a crowd of dancers. There is no engagement. There is no eye contact with the dancers. You look as if you are reading off of your laptop, because, well, you are! Think about the dancer’s viewpoint when you are doing this. You can be more entertaining if you break away from this bad habit. The best way to do this is to spend a lot more time practicing with minimal glances at your computer screen. Memorize more square dance modules if you must. Work on mental image calling. Watch yourself closely in front of a mirror. If you have this habit of relying on your computer screen, break away from it by moving your hands, working on your stance, and make sure you see in the mirror a person who is captivating and engaging, thereby making your calling time on stage appealing and attractive to watch and enjoyable for all at the event that you call, whether you are performing at a beginner hoedown or a major regional or national convention! So take a look at your practice time…in a mirror! One element that I work on with callers is becoming more engaging. I am available for consultation, private training, and I even offer free modern square dance caller school sessions from time to time. PLUS level dancers always seem to have the most enthusiasm. I do not know why, but they always do. Perhaps it is the Load the Boats. No, wait, it’s the Relay the Deuceys. No, it’s the Chase Rights, it’s gotta be the Chase Rights! Well, anyway, all square dance callers can always use a few more singing call figures. After all, many different figures lead to better dancing capabilities for everyone, and good attention and high interest (not to be confused with high yield interest bank accounts) creates better engagement, as well. For many callers, one of the trickiest parts of programming a square dance is hitting the right sweet spot in terms of choreographic difficulty and not leave all sorts of people on the dance floor scratching their heads as they wait for a chance to get moving again. Taking the time to find sequences that work well and spending time becoming educated in how to effectively command those sequences to a dance floor is one of the core elements to success for all square dance callers. Here are a foursome of Plus level square dance singing call figures that will make club dancing interesting and engaging. Changing the choreography is kind of expected at the PLUS level of square dancing, so as you do a singing call make those bids for greater variety throughout all of your tips that you call. CALLING TIP! If you plan to call a workshop tip try applying a couple of singing call figures that use the figures taught and reinforce the calls. By taking this combined approach it is almost like a chef preparing an appetizer that compliments the newly learned choreography in the “main course,” the singing call. All callers can use the figures in this article when exploring for ideas for a PLUS level dance and feel free to communicate with me if you have a different idea that might be incorporated into various square dance choreographic programs for any educational projects in the future. I am available for training and private one-on-one coaching. Feel free to call me.